We have been thinking about Morse code and how to approach learning it. There is interest in our local Boy Scout troop to learn Morse code in pursuit of the new Morse Code Interpreter's Strip. We recently discovered an interesting website to help people learn Morse code online called Learn CW Online. One of the attractive aspects of this site is that all lessons are accessed via a web browser without requiring a download or installing software. A complete Koch CW course is available on the site via the browser - for FREE. The Koch method is a popular teaching method and named after the German psychologist Ludwig Koch. The Koch method teaches at the full target speed from the outset, first with just two characters (K and M). Once a student has mastered the first two characters by being able to copy at 90% accuracy, an additional character (letter, number, or prosign) is added, and so on until the complete character set is mastered. Example: CW Course results from lesson 1 showing we are ready for lesson 2. We really like how the CW course is organized into lessons and how feedback is provided so you can see how you are doing. There is even a recommendation provided indicating when you are ready to move to the next course and learn a new letter, number, or prosign. This is a fun and easy way to learn Morse Code. We recommend LCWO.net for anyone interested in learning CW (Morse code). Once you have mastered the character set, an excellent (and free) resource for improving your code recognition speed is by listening to the regularly scheduled code practice broadcasts by the ARRL's station W1AW on shortwave. 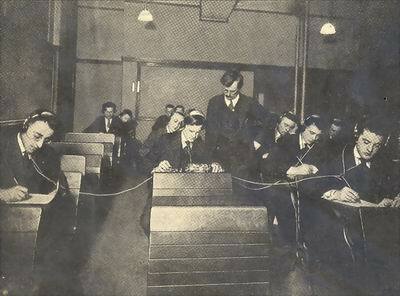 Carrying on a five-minute conversation in Morse Code at a speed of at least 5 words per minute. Copying correctly a two-minute message sent in Morse Code at a minimum of 5 words per minute. Copying means writing the message down as it is received. Sending a 25 word written document in Morse Code at a minimum of 5 words per minute. Requirements #1 and #3 imply that the scout will need to also learn how send Morse code with a key. Scouts will need to either buy or have access to a Morse code key and a code practice oscillator. The PicoKeyer Plus is an inexpensive and easy-to-build kit that can be used a small self-contained code practice oscillator (just add a key). Our local amateur radio club (Skyview Radio Society) offers Morse code practice nights using the club's repeater for discussion and transmitting morse code on a 10m frequency. There is no one right way to learn something. Each person is different including how they learn a new skill or language. The ARRL has an excellent webpage, Learning Morse Code. NJ2X.COM Kindle edition is now available.